The good news is that now the quilt assembly should be pretty quick. We'll see how far I can get today. 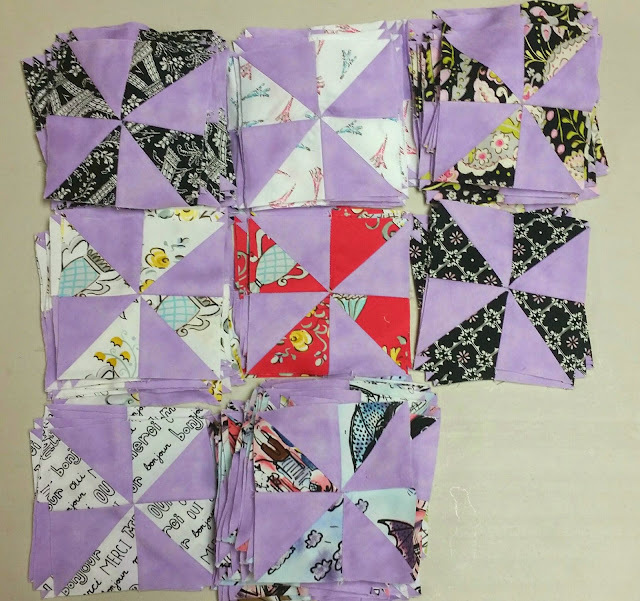 Now I'm linking up with Patchwork Times for Design Wall Monday, with aylin-nilya for Monday Makers, with Hug a Bit Quilts for Monday Makers, and with Cooking Up Quilts for Main Crush Monday. Good luck with your progress today! That IS a lot! Hope you are having a good sewing day today! How big are the HSTs and the resulting pinwheels? I like the lavender constant. I look forward to seeing how this turns out. May your work go smoothly today! Looks like a fun quilt so far. Lovely blocks. Wish I had something to link up today but the wedding is taking that time instead. I hope to be back to sewing again soon. Good luck with your progress! thank you for linking up with Monday Makers! over at Hug-a-Bit Quilts. Ooooh la la - that is a LOT of pinwheel blocks - very pretty!